Okay I lied, this is a book, but it’s certainly not a novel. Instead, Dinah Bucholz mines the beloved Harry Potter series for every single mention of food, and presents you with tons of family-friendly recipes to make dishes that are both deliciously magical – Pumpkin Pasties and Treacle Tart – to the decidedly British – Mrs. Weasley’s meat pies and Yorkshire Pudding. 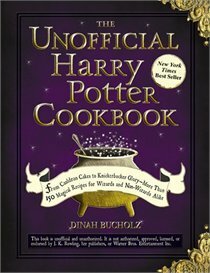 Don’t be fooled by similarly themed cookbooks, Bucholz’s has been touted as THE Harry Potter cookbook to buy, and a great way to create some magic and smiles in the kitchen. One of my favourite books is Jacqueline Susann’s 1960s classic, Valley of the Dolls. If you’ve never read it, it’s the shockingly relevant inside tale of the Hollywood machine and how it independently destroys the lives of three, bright-eyed, ambitious young women, in part through the consumption of ‘dolls’ – or uppers and downers as most of us would know them. 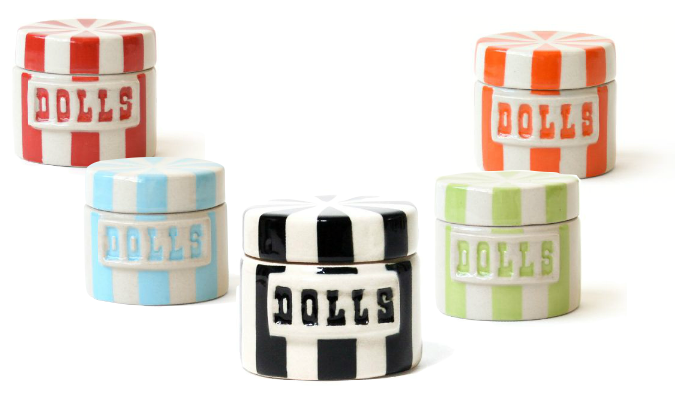 These circus-inspired stoneware containers can certainly be used to store your desktop stash o’Tylenol, but they’re also cute storage solutions for rings, mints, or spare change. You know that old dichotomy of the jocks versus the brains? Consider the worlds as officially collided with Novel-T’s line of simplistic odes to the great writers and characters of our time. 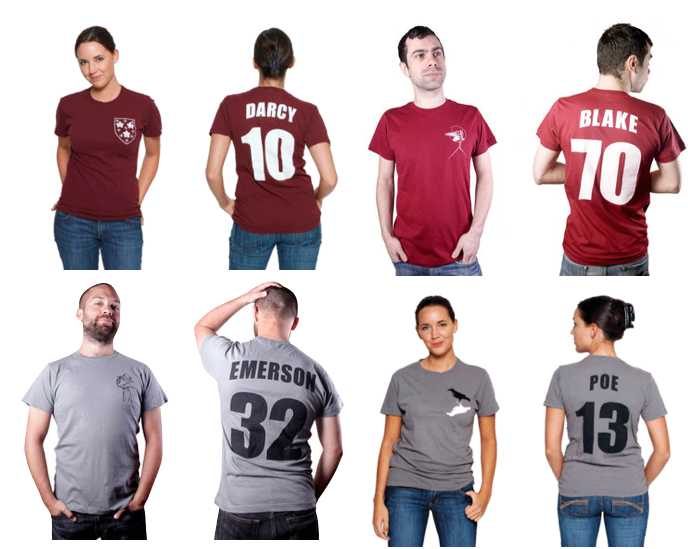 Each top features an iconic reference to the literary work – like Poe’s ‘The Raven’ along with a jersey-style callout and number on the back. Perfect for your nerdy sibling that’s tearing up the halls in University! Want to wear your bookworm heart on your sleeve? 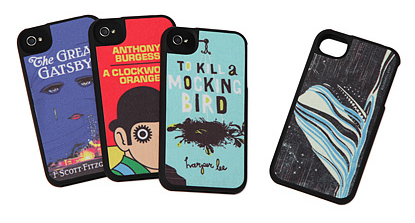 These pretty iPhone skins feature classic artwork from some of the greatest classics of all time: whether you want to go for the stark, psychotic look of ‘A Clockwork Orange’ or the girly ambiance of ‘To Kill A Mockingbird’, these literary gems make a great accompaniment to the purchase of a new iPhone as a gift this year. Scottish jewelery shop LunarraStar is home to a bounty of book-themed items, particularly if your giftee is a big fan of Frank L. Baum’s The Wizard of Oz or Lewis Carroll’s Alice in Wonderland. 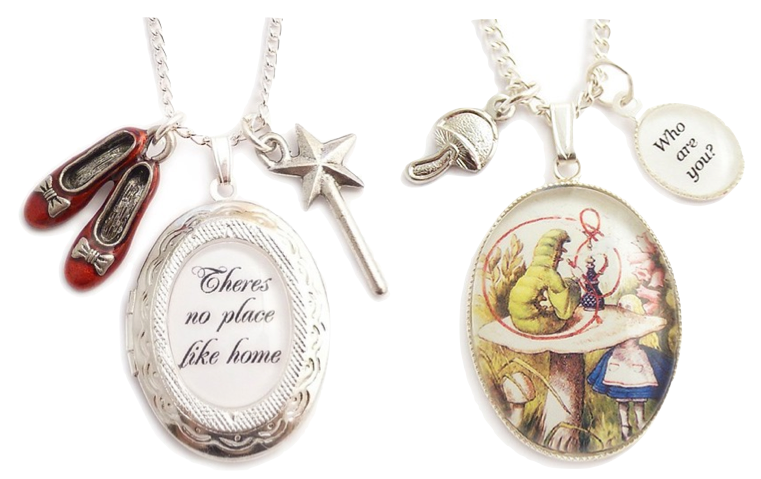 Go for cheery charm necklaces like the ones pictured above, or snag your favourite quote in the form of a chunky cocktail ring. Awesome idea for your best friend that always has books on the brain and loves whimsical, Victorian-inspired gems.